Bank of America is one of the largest investors in the coal sector and has lent billions of dollars to companies seeking to build new coal-fired power plants. The company's clients include the major players in the power and utility industry.Bank of America has also financed billions of dollars to companies that practice mountaintop removal coal mining, a technique that blasts off the tops of mountains to reach the underlying coal deposits. From 2007 to 2009, Bank of America has been the target of more than two dozen protests over its financing of the coal industry. Protests have taken place in California, Florida, Massachusetts, North Carolina, Oregon, Tennessee, Texas, and Virginia. Groups organizing the protests including Mountain Justice, Rainforest Action Network, Coal River Mountain Watch, Appalachian Voices, Rising Tide North America, Mountain Justice Summer, Student Environmental Action Coalition, Energy Justice Network, Blue Ridge Earth First!, Rising Tide North America, Rising Tide Boston, City Life/Vida Urbana and Everglades Earth First!. In March 2007, Bank of America announced a $20 billion initiative to "support the growth of environmentally sustainable business activity to address global climate changes." However, the Rainforest Action Network said that less than 2 percent of the assets were committed to fighting global warming and was still significantly invested in the coal industry. In December 2008, Bank of America announced a new investment policy to promote the "responsible use of coal." The policy involves phasing out financing for companies whose "predominant method of extracting coal is through mountain top removal" but increasing the financing of carbon capture and storage (carbon sequestration)." The former was praised by environmental groups but the latter was condemned. For more, see the main article on Bank of America. In December 2008, Bank of America announced a new investment policy to "ensure that Bank of America plays a significant role as a leading financial services company in promoting the responsible use of coal... We will support, adopt, and adhere to leading practices for managing the environmental impacts associated with coal." The bank’s new policy supports technologies such as carbon capture and storage (CCS) and seeks to promote the development and implementation of CCS technologies to reduce CO2 emissions. The policy also includes a phase out of financing for "companies whose predominant method of extracting coal is through mountain top removal (MTR)." Bank of America currently provides financing to of the nation’s top mountaintop removal coal-mining operators, which together produce more than 250 million tons of coal each year. Environmental groups praised the decision to phase out MTR financing as a big step forward but criticized the Bank's commitment to CCS technologies. Rainforest Action Network commented that "CCS is not yet close to being commercially viable and has pushed energy efficiency and renewable energy sources as far better investments." In March 2007, Bank of America announced a $20 billion initiative "to support the growth of environmentally sustainable business activity to address global climate changes." However, in actuality the bank is committing less than 2 percent of its assets to fighting global warming and continues to invest significantly in the coal industry, one of the leading causes of climate change. In November 2011, Bank of America was listed as the number 3 top global financier of coal-fired power plants in a report complied by various environmental groups entitled, Bankrolling Climate Change: A Look into the Portfolios of the World's Largest Banks. The report noted that Bank of America spent $8,272 million euros on coal plants around the world since 2005. Bank of America has also financed billions of dollars to companies that practice mountaintop removal coal mining, a technique that blasts off the tops of mountains to reach the underlying coal deposits. In 2005, Bank of America helped fund over $500 million for Alpha Natural Resources, which operates 27 surface mines in Kentucky, Pennsylvania, Virginia, and West Virginia. Arch Coal, which is the 2nd largest mining company in the nation and operates mines in Colorado, Kentucky, Virginia, West Virginia, and Wyoming, received a five-year, $700 million loan from Bank of America. In 2006, the bank also helped finance $175 million for Massey Energy, which is being sued by the EPA for violating the Clean Water Act over 4500 times and faces up to $2.4 billion in fines. Foundation Coal, the 4th largest coal mining company in the U.S., also received $835 million in financing from Bank of America in 2006. SCAN activists occupy a Bank of America branch in Asheville, NC, on Aug. 13, 2007. 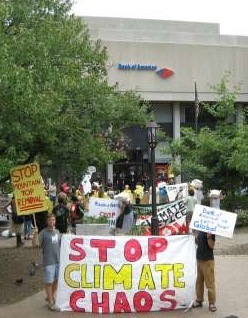 On August 13, 2007, 150 activists from Southeast Convergence for Climate Action occupied a Bank of America branch in Asheville, North Carolina. The protestors condemned Bank of America's ongoing funding of mountaintop removal mining in Appalachia. Two people locked themselves to the main lobby, while others blockaded the entrance to the branch, and delivered coal to the bank's managers. Five people were arrested. Mountain Justice called for a National Day of Action against Bank of America. Events took place in California, Massachusetts, Tennessee, Texas, Virginia. Activists in Knoxville, TN set up a table outside a Bank of America branch, where they held signs and gave information to Bank customers about the bank’s ties to the coal industry. In Houston, TX, members of Rainforest Action Network released a banner in a downtown branch of Bank of America. The banner said “Bank of America STOP funding mountain top removal” and was held in the air by over two dozen helium-filled balloons. Bank security was unable to remove the banner, which remained there until the balloons lost their helium. Blue Ridge Earth First! debuted with three actions in Virginia that targeted Bank of America. In Blacksburg, BREF! dropped a banner on Virginia Tech’s campus shortly before lunchtime and, in the afternoon, protested at the Blacksburg Bank of America Branch. On October 23, four activists with Rainforest Action Network, scale a 15 story crane across the street from Bank of America's corporate headquarters in downtown Charlotte. Reading "Bank of America:Funding Coal, Killing Communities" the banner hang protested the bank's funding of mountaintop removal and new coal plant development. The banner hang disrupted traffic for several blocks until police and firefighters brought down the activists. All four were arrested. Rainforest Action Network activists stage a "cough-in" at a Citibank branch in San Francisco, CA, on Nov. 15, 2007. On November 15, 2007, Rainforest Action Network activists - acting together with allies from Coal River Mountain Watch, Appalachian Voices, Rising Tide North America, Mountain Justice Summer, Student Environmental Action Coalition, and [h[Energy Justice Network]] - staged dozens of actions against Citibank and Bank of America branches in cities across the county, in protest of those two companies' refusal to stop funding new coal power plant development and coal mountaintop removal mining. In San Francisco, RAN activists attached caution tape - reading "Global Warming Crime Scene" - to dozens of Bank of America and Citibank ATMs, and held "cough-ins" in several branches. Similar ATM closure actions were held in New York City, Davis (CA), Los Angeles, Portland (OR), and St. Petersburg (FL), while protests against the two companies were held in numerous other cities. Santa Claus brought a sack of coal to a Charlottesville, VA Bank of America branch, while Blue Ridge Earth First! Coal Carolers sang carols that had been rewritten to disparage coal. Meanwhile, other EF!-ers spoke to customers and handed out flyers. Activists with Blue Ridge Earth First! demonstrated at the Bank of America branch in Charlottesville to tell bank management "Divest from Coal. Invest in Clean Energy." As carolers sang coal-themed versions of Christmas classics such as “I'm Having Nightmares of a Coal Christmas” to the tune of “I'm Dreaming of A White Christmas,” Santa again delivered a sack of coal to the bank, checking off the naughtiest corporation on his list. The Blue Ridge Earth First! Coal Carolers paid two more visits to Bank of America in Charlottesville, VA before Christmas. On March 6, 2008, approximately two dozen Mountain Justice activists visited a Bank of America in Boone North Carolina to protest the bank's funding of mountaintop removal coal mining and coal-fired power plants. The action was the third bluegrass-themed protest in a week in which Action Jackson, an Appalachian string band from East Tennessee staged a traditional fiddle and banjo jam inside a Bank of America branch while others demonstrated in opposition to Bank of America's investments in coal. Four people blockade a Bank of America branch in Boston. On April 1, 2008, as part of the Fossil Fools International Day of Action, four activists used lockboxes to block the entrance to a Bank of America branch in Boston, in protest of BofA's investments in coal mountaintop removal mining and new coal power plant development. 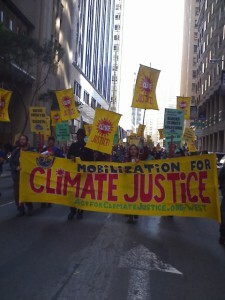 Others held banners and signs in support of the action, which was organized with help from Rising Tide North America and Rainforest Action Network. Police used saws to cut through the lockboxes, and arrested the four blockaders. On June 26, 2008, activists from Rainforest Action Network demonstrated outside Bank of America's Charlotte, NC headquarters, carrying a banner that read "Divest from Coal!" The group distributed fliers on the bank's investments in the coal industry to employees and local residents. Police were on hand, but no one was arrested. On August 11, 2008, 50 activists began marching at Monroe Park around noon and made stops at the offices of coal mining giant, Massey Energy, Virginia Department of Environmental Quality, Dominion Virginia Power, and ended at Bank of America, a major funder of coal. Two activists were arrested after locking themselves to a Bank of America sign. The march and lock-down was the culmination of a week of environmental and climate justice training, networking and strategizing at the Southeast Convergence for Climate Action. The march included jesters, people holding larger-than-life puppets, banners and signs to raise awareness about the climate crisis. In San Francisco, activists with the Rainforest Action Network infiltrated Dominion CEO Thomas F. Farrell II’s presentation at Bank of America’s Annual Investment Conference. Farrell’s PowerPoint presentation was replaced with a slideshow of a protest at the Wise County Plant in Virginia, which had taken place earlier that day. Students, community groups, and activists held a public rally outside Bank of America's Harvard Square branch, protesting both Bank of America's and Citi's risky investment strategies, which have contributed to the current economic crisis and are jeopardizing the global climate. The demonstrators then marched to a nearby Citi branch, where four activists wearing t-shirts reading "Not with Our Money" locked themselves to the entrance. The protest was organized by Rising Tide Boston and City Life/Vida Urbana. On Halloween, a group of zombies teamed up with Rising Tide Boston in a march to local branches of Bank of America and Citi, in protest of the bank's role in mountaintop removal mining. Everglades Earth First! and Rainforest Action Network gave a presentation via megaphone at a cocktail party for Bank of America’s Energy Conference at the Ritz-Carlton Hotel in Miami, FL. The presentation outlined why the Bank should “move away from dirty energy and toward better energy solutions.” A group of conference-goers attacked the group, trying to wrestle banners away from protesters and pouring beer on them. No one was arrested, but the next day two protesters who returned to hand out information were detained by hotel security and police and received a trespassing warning. Rising Tide Boston set up “Green Coal” marketing tables outside branches of Bank of America and Citibank to highlight these banks high-risk investments in coal power and mining. Emulating the coal industry’s marketing pitch of “clean coal”, activists handed out samples of “green coal” while informing fellow citizens not to expect “green coal” to be clean, safe, or affordable. Rising Tide Boston held this event as part of the Day of Action Against Coal Finance, joining over 50 cities across the country to protest Citi and Bank of America’s investments in the coal industry. Seven activists from Rising Tide Boston disrupted a lecture given by Arch Coal CEO Steve Leer at Harvard University. Leer was speaking about the future of "clean coal" technology. The activists interjected information on the impacts of coal extraction, including their final question, "What gives you the right to gamble the future of civilization on a magic technology that doesn’t exist?" While Leer tried to ignore the question, two members of Rising Tide carried a banner on stage that read "The coal bubble is bursting - Clean Coal is a Dirty Lie." The lecture was funded by Bank of America. On Valentine's Day, Rising Tide Boston and City Life/Vida Urbana called for account holders to "break up with Bank of America." The two groups hosted a day of account closures at the Copley Square and Fields Corner Bank of America branches, highlighting connections between the current financial, foreclosure, and climate crises. A street theater version of the Jerry Springer show (with guests Ivanna Goodbank, Vida Urbana, and Bo America) took place at the Copley Square branch. Members of Mountain Justice and Earth First! from Florida and Appalachia disrupted the lobby of a Bank of America branch in Sarasota, FL in protest of the Bank's continued funding of mountaintop removal mining and the construction of new coal-fired power plants despite recent claims of environmental concern. While several folks distributed informational hand-outs about BoA's investments in coal to tellers and account-holders, one individual played bluegrass banjo to celebrate the culture of the Appalachian region that BoA's investments so threaten. The activists' signs read, "Bank of America: still funding coal, killing communities." An activist with Mannequins for Climate Justice chained himself to the doors of the Kenmore Square branch just before it opened. The protester, who called himself Guy Fox, said of his actions, "Even a dummy like me can see that Bank of America’s massive loans to coal companies and support for the epidemic of foreclosures and evictions has to stop now." Activists march against Bank of America on November 30, 2009. More than 200 activists from Rainforest Action Network and other environmental groups marched to the Bank of America skyscraper in San Francisco to protest the bank's coal financing and interference in climate legislation. Dozens of protesters blockaded the building, some of whom locked themselves inside the building's revolving doors to disrupt business. 22 activists were arrested. ↑ 1.0 1.1 Bank of America Coal Policy, Bank of America, accessed December 2008. ↑ 2.0 2.1 "Bank of America Decision to Stop Funding Mountaintop Removal a Victory for Appalachia and Anti-Coal Movement," Rainforest Action Network, December 3, 2008. ↑ "Bank of America Announces $20 Billion Environmental Initiative", PR Newswire, March 6, 2007. ↑ Global Finance, Rainforest Action Network, accessed July 2008. ↑ 6.0 6.1 "Banks, Climate Change, and the New Coal Rush", Rainforest Action Network, 2007. ↑ Protestors, Police Amass in Downtown Asheville, Mountain Xpress, August 13, 2007. ↑ Southeast Convergence for Climate Action Shuts Down Bank of America, Blue Ridge Earth First! website, August 14, 2007. ↑ Thousands Take to the Streets to Protest Citi and Bank of America’s Coal Investments, Rainforest Action Network press release, November 16, 2007. For photos, see RAN's Flickr page. ↑ "An April Fools Protest", Boston Globe, April 1, 2008. ↑ "Activists Blockade Bank of America to Protest Funding of Coal, Boston", Fossil Fools Day blog, April 1, 2008. ↑ "Bank of America's Coal Investments Revisited", The Understory, June 26, 2008. ↑ “Dominion CEO Punk’d!”, Rainforest Action Network’s Understory blog, September 15, 2008. ↑ "Protestors Tell Citi and Bank of America: "Not With Our Money, End Your Destructive Investments’", Rainforest Action Network, September 27, 2008. ↑ "Protesters tell Citi and Bank of America: Not with our money, end your destructive investments", Rising Tide Boston website, accessed March 24, 2009. ↑ "Zombies tell Bank of America:"Coal is killing us! ", Rising Tide Boston website, accessed March 24, 2009. ↑ Annie, “A crazy kick-off for Day of Action against Coal Finance”, Rainforest Action Network Understory website, November 13, 2008. ↑ “Rising Tide helps banks market “Green Coal”, Rising Tide Boston website, November 14, 2008. ↑ "Rising Tide Boston Crashes Talk by Arch Coal CEO," Power Past Coal, February 5, 2009. ↑ "Rising Tide Boston and City Life/Vida Urbana organize mass account closing at Bank of America", Rising Tide Boston website, accessed March 24, 2009. ↑ "Bluegrass at the bank strikes again!," Mountain Justice Summer, March 20, 2009. ↑ "Mannequins for Climate Justice Shut Down Bank of America," Power Past Coal, March 31, 2009. ↑ "San Francisco Climate Justice Action at Bank of America; 200 Rally with at least 22 Arrested," The Understory, November 30, 2009. This page was last edited on 30 November 2011, at 23:06.